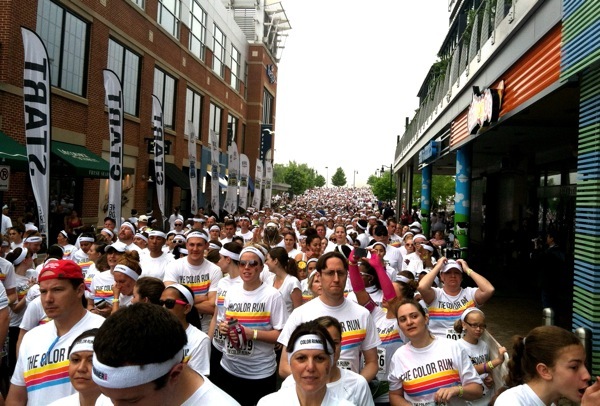 More than 5,000 participants ran and walked the Color Run at National Harbor this year. The corral began 15 minutes early at 8:45 AM. The last wave took off at 10 AM. Photograph by Melissa Romero. 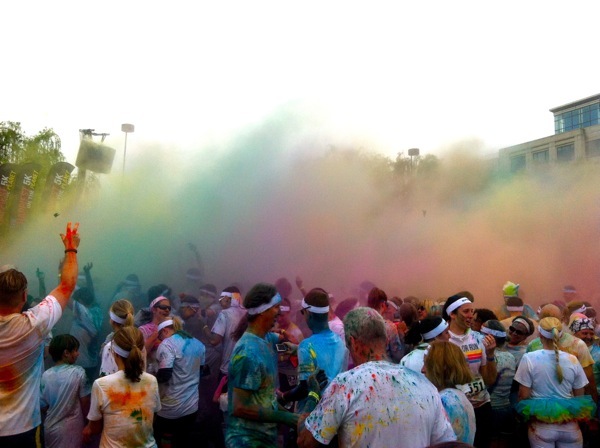 Some participants began the color-blasting party before the start of the run. Photograph by Melissa Romero. 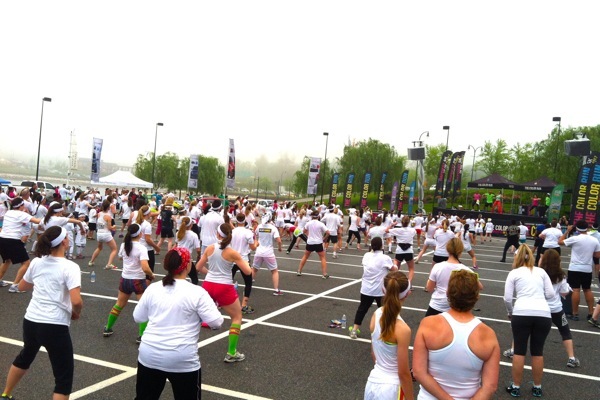 Dupont Circle studio Jordin’s Paradise led participants in a Zumba warmup before the run. Photograph by Melissa Romero. 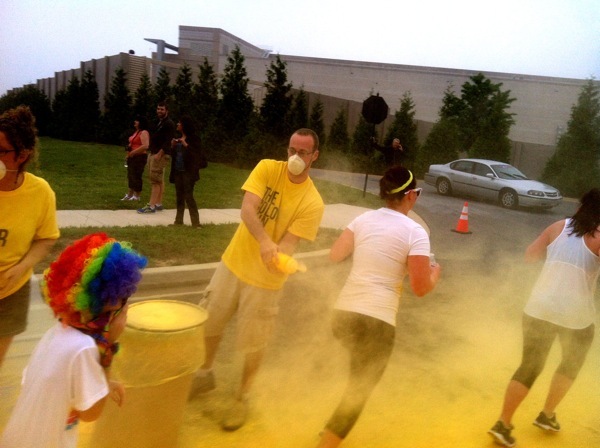 Runners get doused in yellow powder at the first kilometer of the run. 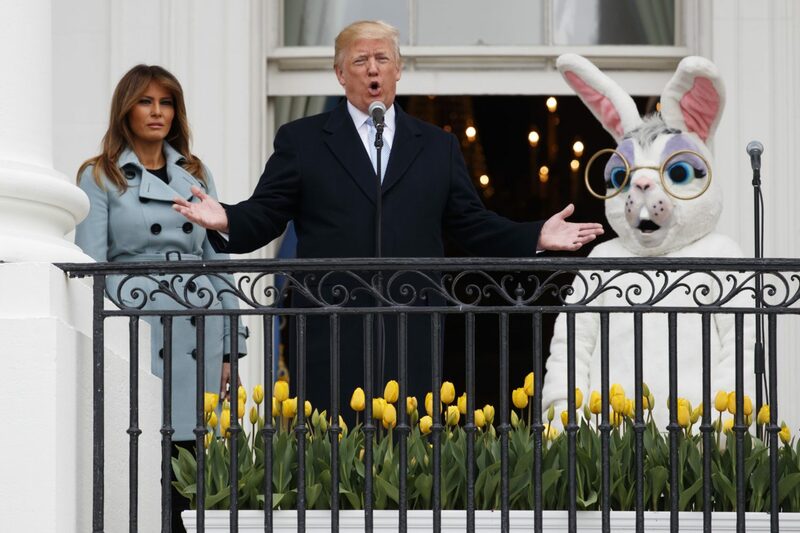 Photograph by Melissa Romero. 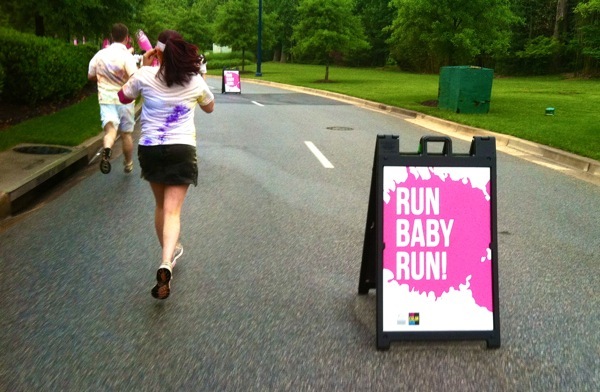 Signs of encouragement dot the 3.1-mile Color Run course. 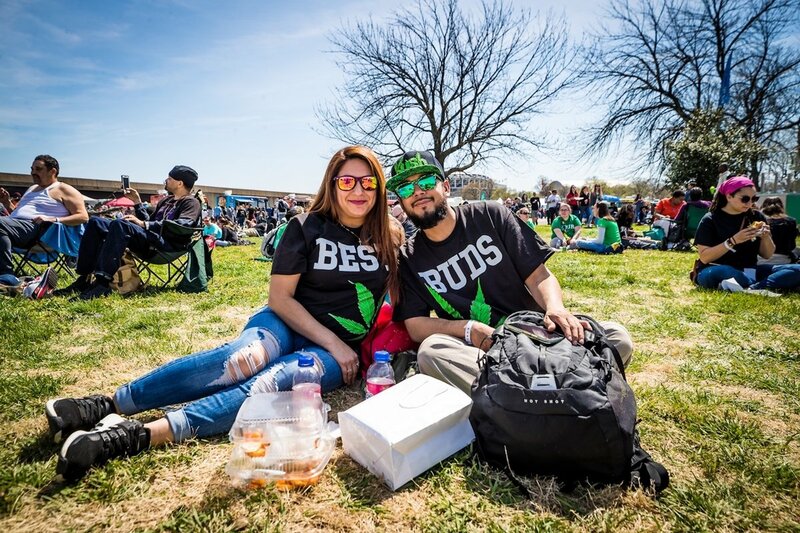 Photograph by Melissa Romero. 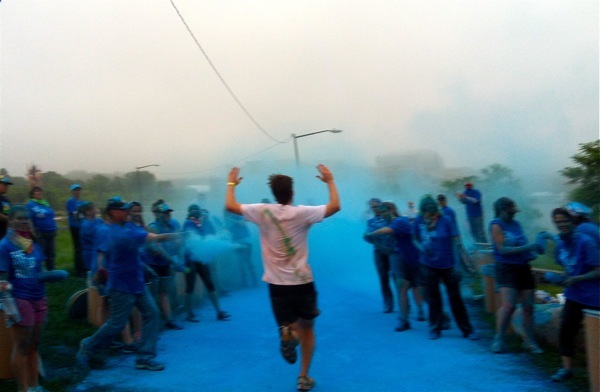 A participant runs through the last kilometer and is doused with blue powder. Photograph by Melissa Romero. 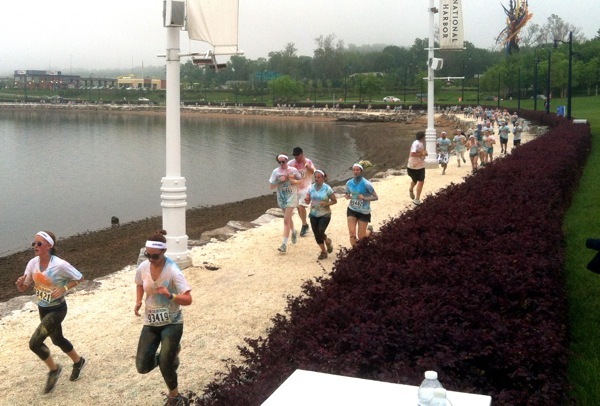 The last leg of the Color Run takes runners and walkers along the harbor. Photograph by Melissa Romero. 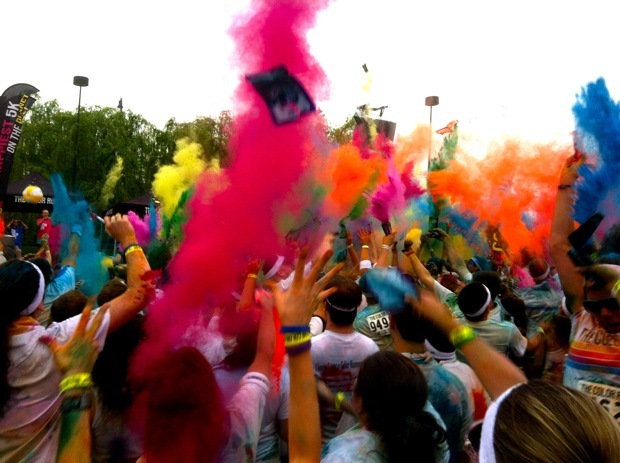 All participants receive color packets filled with powder and are encouraged to save them for the color blast at the finish line. 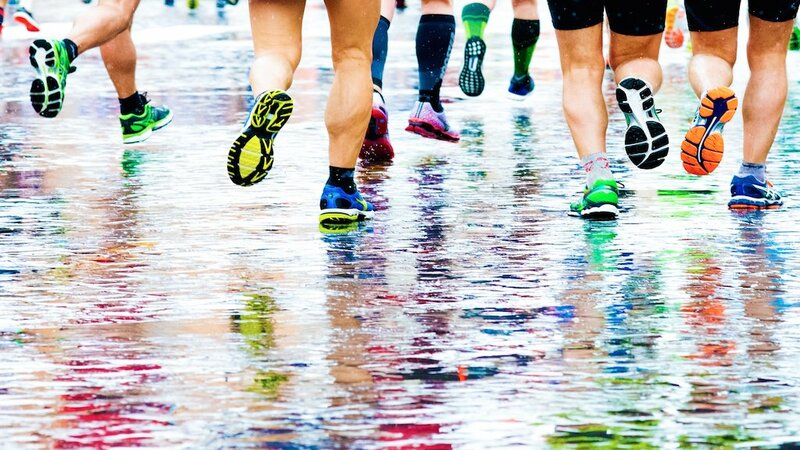 Photograph by Melissa Romero. 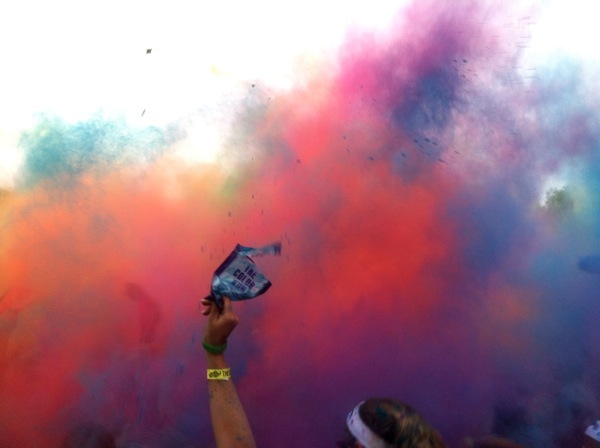 The finish line of the Color Run becomes a big dance party. Photograph by Melissa Romero. 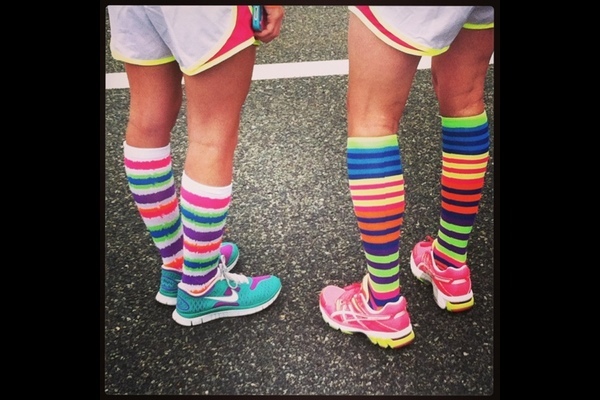 Participants add a splash of color to their running outfits with striped socks. Photograph by Melissa Romero. 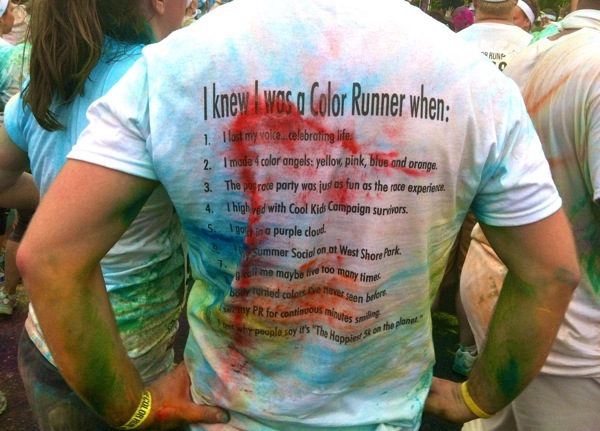 A man wears a color-splattered Color Run T-shirt. Photograph by Melissa Romero. 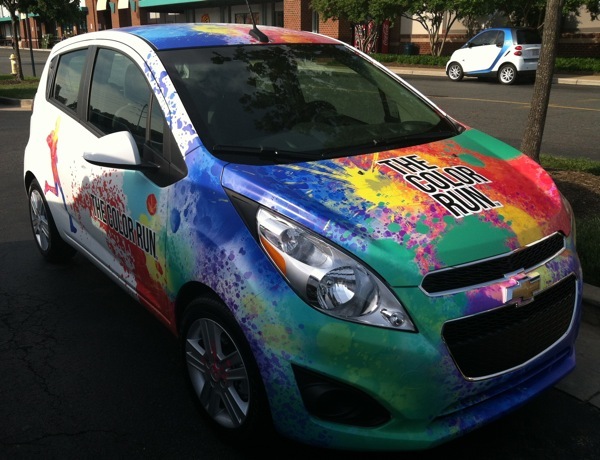 The Color Run’s car makes a trip to every run location. Photograph by Melissa Romero. 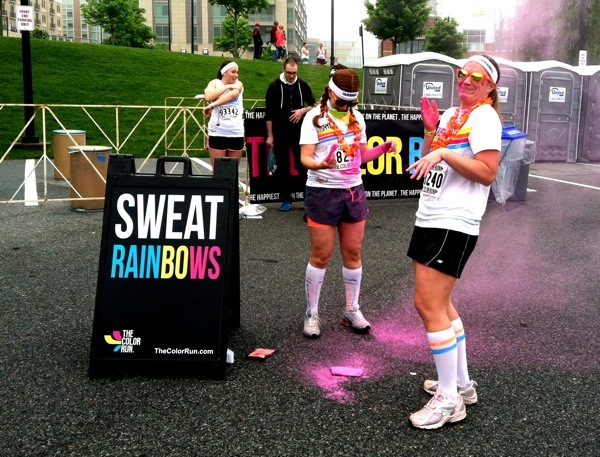 A participant checks out his color-splattered glasses post-run. Photograph by Melissa Romero. 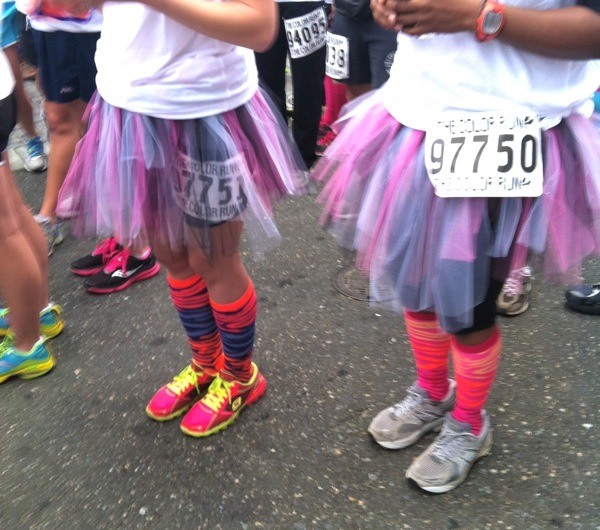 Participants are only required to wear white for the run, but plenty go the extra mile and dress in tutus, too. Photograph by Melissa Romero. 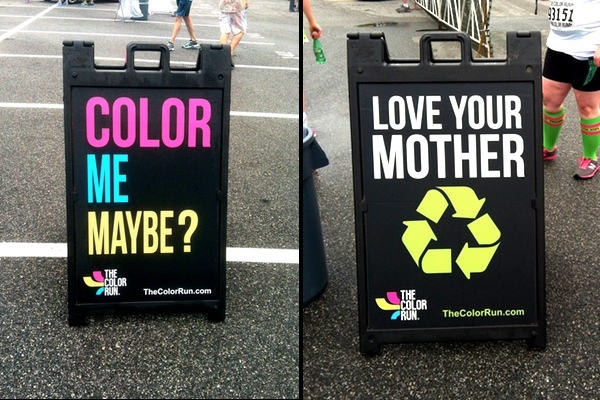 Plenty of clever signs are stationed around the finish line party. Photograph by Melissa Romero. The crowd grows at the dance pit as later waves continue to cross the finish line. Photograph by Melissa Romero. 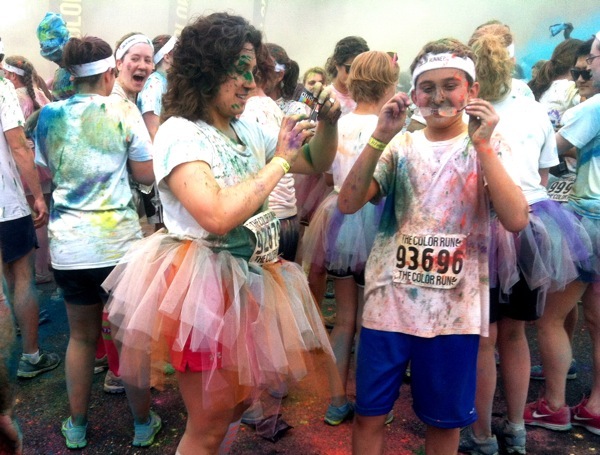 Health blogger Melissa Romero stands in a mess of colored powder at the finish line. 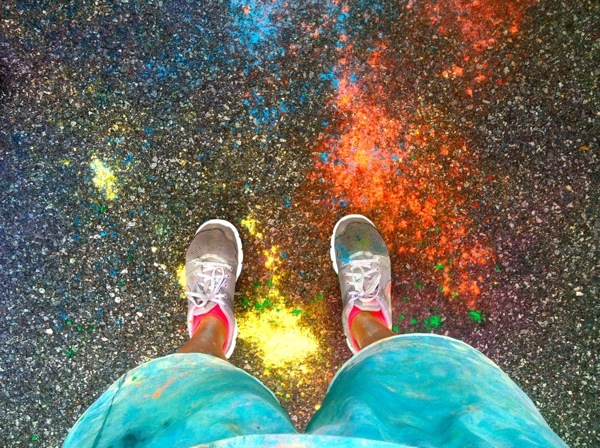 Photograph by Melissa Romero.